The Patriot could be the thing that prevents a nuclear exchange in the middle east! 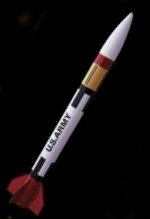 Easy to build, easy to finish with provided decal set, this near-1/10 scale DEFENSIVE missile has saved hundreds of lives... but this model isn't very good if you want do blast semi-scale SCUDs out of the air. Kinda like the real thing, actually ;-) At least this kit is a LOT cheaper than the real thing!